Welcome to 19 Broad. As Proprietors, we care deeply about our property and our guests. We are a City of Charleston licensed rental. 19 Broad is downtown Charleston's finest apartment accommodation, with a location second to none — perfect for couples, families and business travelers who seek the space and privacy of a full apartment without the expense of a hotel room. Normandy Farm Artisan Bakery occupies the first floor and Oak Steakhouse next door, affording guests direct access to an authentic European-style bakery and fine dining steakhouse restaurant. Our newest and finest restaurant, E (The Establishment), is just across Broad Street and we highly recommend this romantic culinary experience. Our charming circa 1794 property is located at the crux of the French Quarter and historic Charlestowne neighborhoods, within one block of the best shopping, dining, history and architecture in Charleston. World class restaurants within very close walking distance include Husk, FIG, Peninsula Grill, Charleston Grill, Magnolia's, Cru Cafe, McCrady's, Revival, SNOB, and so many more. We recommend an easy nearby walk North on East Bay Street up to Market Street and South on Meeting Street to take in all the restaurant offerings. 19 Broad features original Charleston brick hearths and heart pine floors, period millwork, original moulding and spacious rooms with high ceilings. The property is a renovated and updated bank building dating back to 1794, prominently positioned on historic Broad Street and surrounded by Charleston’s most famous architecture, parks and gardens. Our guest rooms feature quality home furniture, king size beds, full bathrooms with tile floors and showers, large social spaces, cooking and dining spaces, complimentary WiFi and basic cable TV. The entire property can hold ten guests, but can also be subdivided in order to accommodate multiple smaller parties entirely independent from one another. After ascending 19 Broad’s exterior staircase off Broad Street, guests enter a secured foyer located off the second floor landing. Through the foyer, guests continue straight ahead to arrive in a spacious living room, complete with two large sofas, several armchairs, coffee table, gas fireplace, basic cable TV, kitchenette, dining for six to eight and full bathroom with tile shower. At the south end of the living room is the entrance to the master bedroom featuring a king bed, private bathroom with tile shower and basic cable TV. At the north end of the living room is the entrance to the guest bedroom featuring a king bed, gas fireplace, basic cable TV and incorporated living area with seating and coffee table. The Apartment features original floors, walls and ceiling, and massive antique windows overlooking Historic Broad Street, as well as, a flagstone courtyard below. 19 Broad affords all guests complimentary coffee, paper towels, bath towels, wash cloths, toilet tissue and shower gel. While we are happy to direct guests to nearby pharmacies and convenient stores, we do suggest that guests bring personal toiletries and cosmetics in order to ensure optimal comfort. All beds are neatly made with freshly laundered sheets prior to arrival. Our neighborhood constitutes a unique blend of commercial properties and residential homes. Accordingly, the City of Charleston enforces a noise ordinance between the hours of 11:00 pm and 7:00 am. Out of respect for our loyal guests, as well as our neighbors in the City of Charleston, we ask our guests to exercise consideration of their surroundings and to adhere to this ordinance from the hours of 11:00 pm to 7:00 am. For any and every occasion, a vacation in Charleston deserves respectable celebration. Our property is the perfect space for large families, girls’ weekends, golfing trips, wedding parties, traveling couples, and more. Jan and Mike Jacobson are proprietors of Jacobson Building at 19 Broad Street. We care about our property and are delighted to share our most magical apartments with guests of our beloved City of Charleston. We encourage all our guests to call or email us with ANY questions before, during and after their visit with us. Aside from our personal connection to Jacobson Building at 19 Broad, we would like to tell you more about what makes this property so special and attractive to all who visit Charleston. Jacobson Building at 19 Broad's location is second to none: 1 block south of the Historic Charleston City Market, 1 block north of the iconic Battery on Charleston Harbor, 1 block west of Waterfront Park on the Cooper River, and 1 block east of Washington Park, the Four Corners of Law, and Museum Mile. Rainbow Row is less than 1/2 block around the corner on East Bay St. Jacobson Building at 19 Broad is also located on one of the most famous, successful, and eclectic streets in the United States. Broad Street was listed among America's Top 10 Greatest Streets by the American Planning Association. 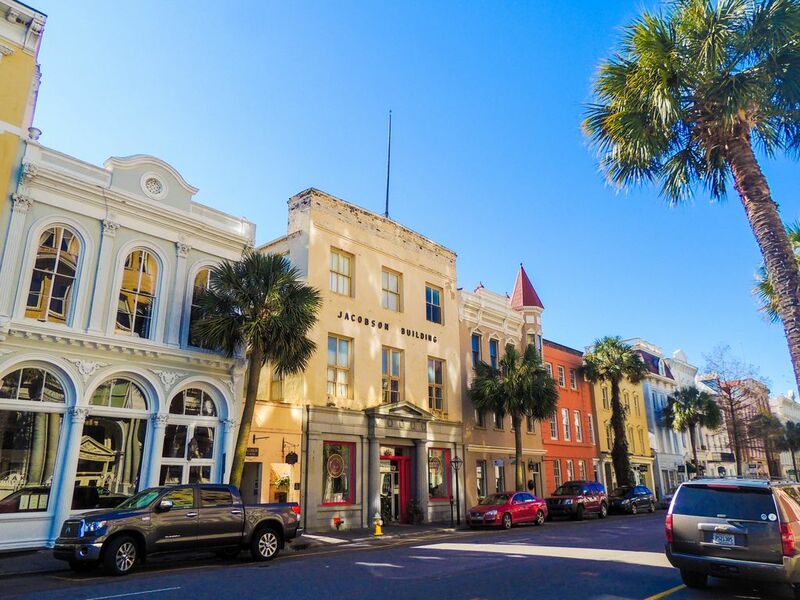 Dubbed "Gallery Row," Broad Street is also Charleston's fine art destination. Broad Street boasts impressive dining options, ranging from wine and cheese shops to historic pubs to top-notch steakhouses. Architecture and room size are also unique benefits of Jacobson Building at 19 Broad. Built in 1794, our apartments offer you the colonial architecture and historical intimacy of centuries old Charleston homes, while affording you the modern functionality and spacious comfort of a commercial building. And last, but not least, is the value you receive by staying at Jacobson Building at 19 Broad. We quote competitive prices for our virtually unmatched locale. In essence our apartments offer the best home away from home for easy access to the history, architecture, coastal scenery, boutique shopping, art galleries, cuisine, and local culture that have won Charleston the World's Top Destination twice and the Nation's Top Destination three times, by Conde Nast. Jacobson Building is a fraction of the cost of Inns in our area. Allow Jacobson Building at 19 Broad to be your bridge to the authentic and sublime. LOCATION. LOCATION. LOCATION. Truly in the heart of the Historic District at the entrance to the prestigious South of Broad. Located above Normandy Farms Artisan Bakery and Cafe and surrounded by Charleston's most tried and true Restaurants. Our apartments are clean, comfortable and quite spacious. We comfortably accommodate the number of guests advertised and our pictures are truly indicative of our product. We intend to attract guests seeking a full apartment with utmost privacy for friends and family, while spending a fraction of the cost of local Historic District inns. Our apartments are completely private. We offer Clean, Comfortable & Spacious Apartments in a Location Second to None. If you add listing #859047, there is an additional 3rd bathroom. Located at 19 Broad Street, between South of Broad and the French Quarter. Broad Street is within the South of Broad area of the Historic District. Lower King is nearby. Three beaches are very close by. Sullivan's Island, Isle of Palms and Folly Beach. Amazing Pristine Harbor at Waterfront Park. Walk 2 short blocks to Waterfront Park. We consider this a must do walk at least once a day. Waterfront Park is less than 2 blocks from Jacobson Building at 19 Broad. Enjoy dolphins, egrets, blue herons and so much more in their natural environment. 2 Original Fireplaces are enjoyed in this apartment. City Garage Parking in Historic District. Car not recommended. City Parking Garage located within half-block. We recommend this as the cost is quite reasonable and below $20/night. We provide lots of fresh towels for all of our guests. We offer a comfortable Queen Sofa Sleeper for additional guests. We make the beds with freshly laundered linens, provide plenty of clean towels, paper products, liquid soap, dish detergent, coffee and pretty much everything you need except your personal items and groceries! Normandy Farms on our first floor is great for bagels, fresh baked breads & desserts, sandwiches, and terrific coffee. Open Monday-Saturday 7:30AM-5PM. We had a girls week in Charleston and booked 19 Broad condo. The condo was just as wonderful as the photos Jan has posted on VRBO. The location couldn’t be more perfect. A block from East Bay with many notable restaurants (as well as Oak Steakhouse which is right next door to staircase up to condo. Lots of room to move around for four people. Jan was so helpful when we had questions and a perfect landlady! We all loved Charleston and would return happily to 19 Broad. Highly recommend this property. Great location and a lovely property. This was a wonderful place to stay! Lovely stay in downtown Charleston. Loved the home, history and all of the accommodations. Parking was an issue for a day or so, but other than that, you can walk anywhere from this location. Felt very safe there and the owners were very accommodating. Thank you, Karen, for your Review. We are sorry about the parking problem you encountered. We encourage all guests to not hesitate to let us know should they have any questions. We would have been happy to rectify the parking situation had we known. We also encourage those flying into Charleston not to rent a car. As you've noticed, walking is much preferred and quite doable in our location. Hope you'll come back to visit. Clean; spacious two bedroom apartment; nice furniture; could use more linens (washcloths and dishtowels); overall very comfortable. The location is great; everything needed is within walking distance including the Battery, markets and downtown. Owners are quick to respond to questions and extremely helpful. Thanks Jan.
Jacobson Building at 19 Broad is a City of Charleston Licensed Rental and is truly in the heart of the Old and Historic District. Our unique location is within the Original Walled City. From our doorstep, you can walk in all directions and remain in the Historic District. You can easily take in all the sites and beauty Historic Charleston is all about. If you are driving to Charleston, we recommend parking in the City Garage within 1/2 block of Jacobson Building at 19 Broad. Our guests put their car safely away and retrieve it upon check-out. All venues and restaurants are very close by. Please be aware when selecting your vacation rental. Families and mature visitors are well served in the Historic District. Rainbow Row, Dock Street Theatre, City Hall, Four Corners of Law, St. Michael's Church, St. Philips Church, King Street Shopping, Market Street, the Battery, Whitepoint Gardens, Waterfront Park, Exchange Building and so much are all very close to Jacobson Building at 19 Broad! Guests should realize that many vacation rentals in Charleston will require a drive to the sites within walking distance of Jacobson Building at 19 Broad Street, even though the locations on the VRBO map seem very close. Charleston is a peninsula that is 2 miles wide. We ask that all guests, upon checkout, empty trash into outside receptacle, gather wet towels into bathroom, leave sheets on beds, load remaining dirty dishes into dishwasher and turn on; leave the apartment in the condition in which it was checked-in. Cleaning fee is for standard cleaning of 2 hours. $250 nonrefundable and nonnegotiable indoor smoking fee. It is tenant's responsibility to report any damage to owner prior to departure so that any necessary charges can be agreed upon. Sorry, but no cancellation refund without replacement renter. MAXIMUM 4 GUESTS. STANDARD RATE DOES NOT APPLY TO ANY YEAR THAT HAS NOT BEEN PRICED BY SEASON.